That being said, I have been wanting to visit The Cloisters from quite some time now. The Cloisters is a beautiful museum, surrounded by gardens, which showcases architecture and art of Medieval Europe. It is a branch of the Metropolitan Museum of Art, which you know I adore. At first glance, the Cloisters appears to be one, very grand castle. Located in Upper Manhattan, at Fort Tryon Park, the distance always held me back. Last weekend, Grant and I made the trek (which we realized was only a half hour), and went to visit the Cloisters. We decided we’d try something new and adventurous, since it was our anniversary weekend. Once we stepped out of the subway we were in awe. The area was incredible. There were trees, and gardens absolutely everywhere. The view from the top of the Cloisters overlooks the Hudson River. With grand archways, winding staircases, and picturesque gardens, I definitely did not even recognize I was in New York. We had so much fun exploring that day. 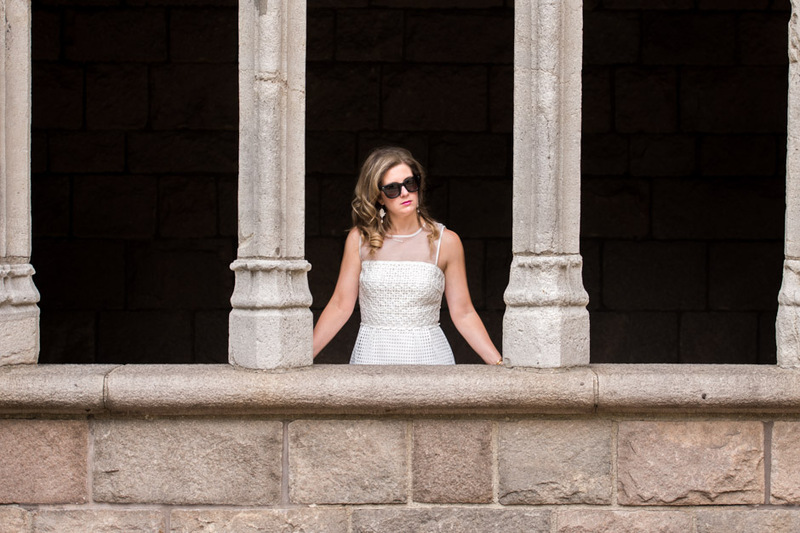 For our outing to the Cloisters, and because we were celebrating our anniversary weekend, I chose a little white dress, by French Connection. 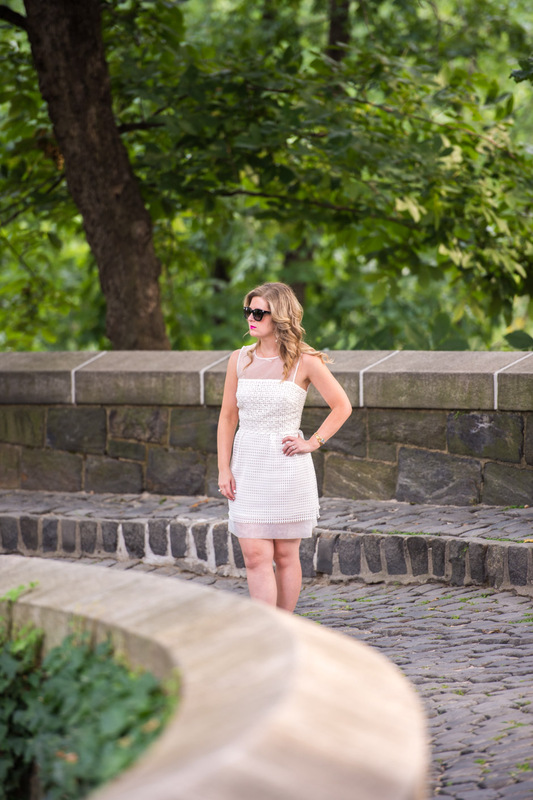 As promised in my previous post (which you’ll want to read here), I decided to feature white dresses all week long, in honor of our anniversary. I love the intricate detailing in this dress, including the sheer, mesh top, and the jacquard overlay. It has such a dainty and feminine look. It’s perfect for a girls’ bunch or an evening cocktail party. However, if you’re like me and live in fancy dresses daily, then slip this little beauty on, and it’ll take you anywhere. That’s exactly what I did. I accessorized my look with my favorite Valentino Round Stud Sunglasses, and gold heeled, Chinese Laundry Imagine Sandals. I was recently introduced to a jewelry brand that I’ve fallen in love with, Luca + Danni. I’m styled in their Swarovski AB Bauble Bangle and Pearl Necklace. Luca + Danni have a fabulous assortment of bracelets that are so much fun to mix and match. The are pure arm candy. 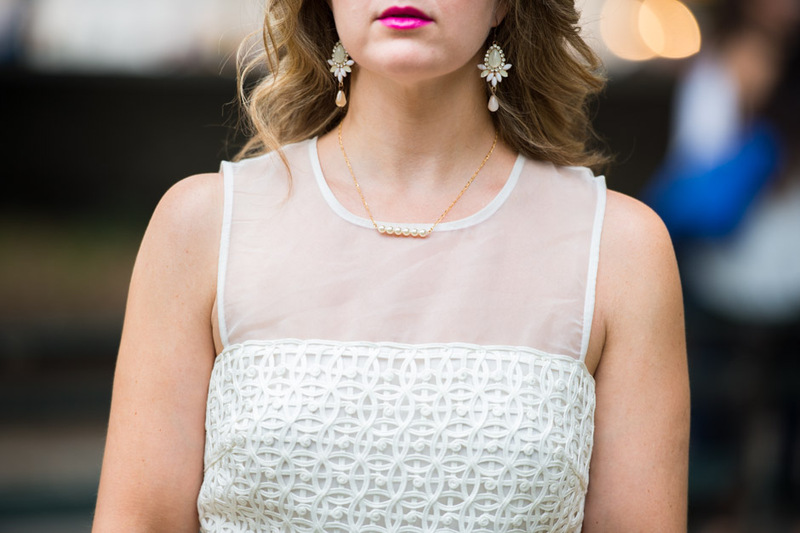 The pearl necklace worked so perfectly with this outfit. It was delicate, and such a lovely addition to my little white dress. Make sure to check out the jewels from Luca + Danni. I know you’ll absolutely love them.